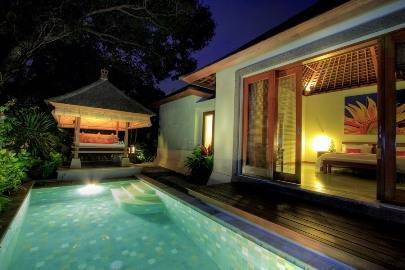 Luxury private villas, Located in the world famous, cosmopolitan village of Seminyak - Bali, Villa Victoria offers their guests a heavenly staying experience in lush and soothing tropical island settings, complimented by a touch of modern luxury. Find the unique combination of the lively, modern neighborhood of Seminyak and a private stay in a post modern-traditional Balinese ambience at Villa Victoria, predestined to become your tropical residence away from home. With a short 20 minutes drive from the airport through a traditional Balinese village, you will stroll into your comforting private villa with world-class facilities, while still located in the heart of the most bustling and exciting area in Bali. The smile and the warm welcome of our dedicated staff will make you forget your long journey and ready experience this unique tropical island. The villas bedrooms are equipped with modern amenities such as Cable TV, DVD player, audio systems, Mini Bar, Refrigerator, Laptop size safety box and internet hotspot to give you conveniences of your own home. Each villa comes with a comfortable dining and sitting area with kitchen facilities, perfect for families, couples, or groups of friends. They are designed with a spacious dressing room, a reading area, and an en-suit bathroom with aromatherapy bath products for your relaxation. Villa Victoria also offers a sizeable swimming pool. European, Chinese and Indonesian food. Serve Breakfast, Lunch, Dinner. In case of cancellation or now-show 72 hours before arrival date, 1 night cancellation fee will be charged. Located in the world famous, cosmopolitan village of Umalas - Seminyak Bali and 20 minutes drive from the airport through a traditional Balinese village. you will stroll into your comforting private villa with world-class facilities, in the heart of the most bustling and exciting area in Bali.